I got a new Traditions barrel and receiver right before deer season. Now I have some time to play with it. The day after deer season I cleaning it. I was amazed that the barrel was full of rust the next day. I read up some and used some metal polish I have for aluminum racing wheels. The results were dramatic to say the least. At least as to how the barrel looks. I haven't fired it yet as I'm waiting for the temperature to get above zero. I have gone through the cycle 3 times so far. Using the 'course polish', cleaning, the fine polish, and deep cleaning. The barrel doesn't look any different after the first polishing, but every time I polish it again, the patches come back black as coal, so they are still polishing. When I polished wheels, you polish until the black goes away. Will that happen here too, or am I wasting my time? The barrel loads all sabots hard except various EZ-load sabots, which I don't want to use. I have run a lead ball through the barrel and measured it. It's very close to .500 and pushing it down the barrel is pretty even, not like the old barrel that was very undersized within 8 inches of the breech. I do not have personal experience with polishing a muzzle loader. I helped a friend gather information to work on his. Below is link that might have some good ideas for you. There is also information out there about coating the bore with telfon based lubricants after it clean and a cotton ball won't leave strands in your barre.. I'll keep looking for it. There is also Bore Coat. If its an aluminum cleaner, I cant see it doing you much good. Try useing a good valve lapping compound and a realy tight patch to LAP the bore, after cleaning it with very hot soapy water. Your aluminum "cleaner" is made for wheels and shiny places. Not a rifle bore. I fear you may be chemicaly stripping metal from the bore. Or at the very least causeing some molecular damage that could weaken the steel. The only thing that touches my BP rifle bores for cleaning and what not are, Hot soapy water and 1000+ bore butter. And the occasional lapping compound. NEVER oil, Oil on the outside good! Oil on inside BAD! I've heard of using Flitz for polishing bores and tried it on a .22 Hornet. I couldn't really tell if it made much difference regarding cleaning. It didn't seem to have any negative effects though, I think my best groups came after the polishing. No major improvements though. If you were to start with a shiny piece of steel and use a polishing or cutting compound you'll always get the black dirty look. With aluminum it goes away because all your doing is removing any oxidization that present. When dealing with rifle barrels you should use a non-embedding compound such as JB paste or bore cleaner. There seems to be a 50/50 split as to even using these products in a rifle barrel. If you use to much of a cutting compound it's possible to take away more metal than you want to leaving you with a over-sized bore. 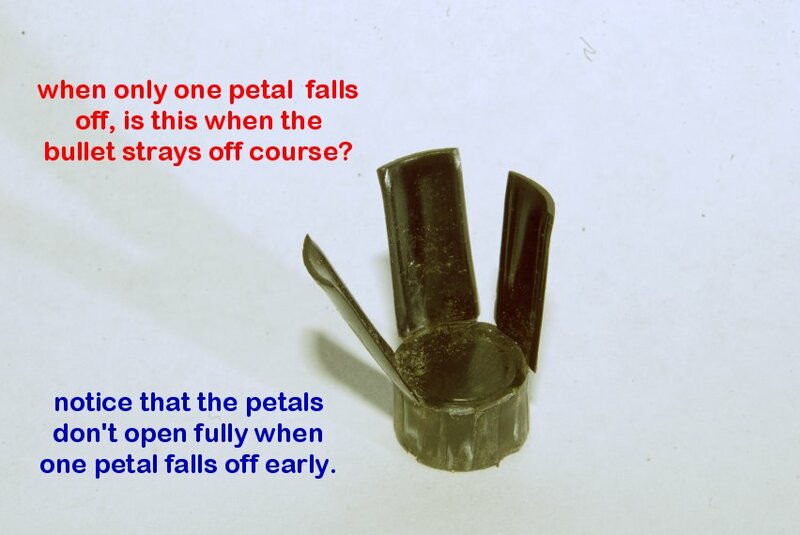 If your using a product that will in-bed itself you take the chance of the bullets fire lapping the bore if your unable to completely remove it. My advise is you should know what your doing before you do it !!! Mix outdoors, in good ventilation. Use a clean 1 gallon metal, chemical-resistant, heavy gage PET or PVC plastic container. NFPA approved plastic gasoline storage containers are also OK. Do NOT use HDPE, which is breathable because the acetone will evaporate. The acetone in ER will attack HDPE in about 6 months, making a heck of a mess! 2. Wet a second patch, and similarly start it into the bore from the breech, this time scrubbing from the throat area forward in 4-5" strokes and gradually advancing until the patch emerges out the muzzle. Waiting approximately 1 minute to let the bore cleaner soak will improve its action. 4. Use a final wet patch pushed straight through the bore to flush out loosened residue dissolved by Ed's Red. Let the patch fall off the jag without pulling it back into the bore. If you are finished firing, leaving the bore wet will protect it from rust for up to 30 days. If the lanolin is incorporated into the mixture, it will protect the firearm from rust for up to two years. For longer term storage I recommend use of Lee Liquid Alox as a Cosmolene substitute. "ER" will readily remove hardened Alox or Cosmolene. I have friends who run a patch with windowcleaner trough the bore right after shooting. They claim that the dirt remains soft and is easely removed afterwards at home with hot water (with a drop of disc cleaning soap added if you wish). Better don't use the wives' best cleaning bucket for this, because I discovered the hard way that it's easier to remove the blackpowder slam out of a barrel than out of a plastic bucket. When you're not going to use the BP-rifle for a longer period, don't forget to oil the last patch with CLP-oil (or other oil that P-rotects) and just make the barrel dry right before next shooting. For cleaning between the shots I use a drill cooling liquid. A friend who's using a Sharps and Browning breechloader in 45-70 and 45-120 uses what he calls a "fat-pill", about 1/4" bulletfat between the bullet and cardboard disc on top of the BP. He can shoot 30-40 times without cleaning his rifle. So it seems that the best cleaning procedure starts with tricks to keep the dirt soft and protect against rust during and right after shooting. It will make actual cleaning much easier afterwards. And protect the bore after cleaning. Nobody likes a brown coloured patch when you want to use the rifle. My polishing had the desired effect. The aluminum polish I use is FLITZ. The 'coarse' polish is Nuvite NuShine II grade F-7. I wasn't trying to make the bore bigger, I knew it was very close to the correct size. I was trying to get it so I could load a sabot without having to use some kind of lube. I don't have a gauge to measure how much it takes to load a round (Barnes 290 grain) but it feels just right now, not too easy and not too hard. I shot a 1 3/8 inch 3 shot group using 120 grains of Blackhorn powder not cleaning between rounds.... those were the 14th, 15th, and 16th bullets I shot today without cleaning. The other 13 bullets I shot were 250 grain as I was trying different loads to get the best accuracy should I use them. After I did my polishing and cleaning, there was a noticeable difference in looking down the barrel. I didn't have too much to loose. When hunting it was impossible to load a 2nd round without bringing along a ton of stuff to clean and lube the barrel. Now all I need is powder, a bullet inside a sabot, and my loading rod. And I'm getting as good or better accuracy without all the cleaning and lubing steps. I'm satisfied. I do appreciate the advice I got. I read several places on the correct steps to use and I guessed on what to use as polish. If the barrel diameter changed, it was less than a thou by my measurement. Try polish then wipe with Lee Liquid Alox mixed 50-50 with mineral spirit..
Holy Crap You've been through a lot with that gun. Here is why I wanted to use the Barnes 290 grain bullet. For my rifle they have always flown as straight as I am able to shoot. One reason (I think) is that their sabots are so well built and designed that they allow the bullet to fly straight every time. I have a bag of found sabots and they all look like this. As you can see with the black sabots, some open fully and some loose a single petal (early?) and stray off course. So with the black sabots it's not unusual to have two almost touching then one 3 inches away or more. The black sabots are supposedly made by the same company as the Barnes, but are a couple thou smaller in diameter to make them load easier. Before I polished my barrel they would not load without lube either. I don't like any of the EZ load sabots. 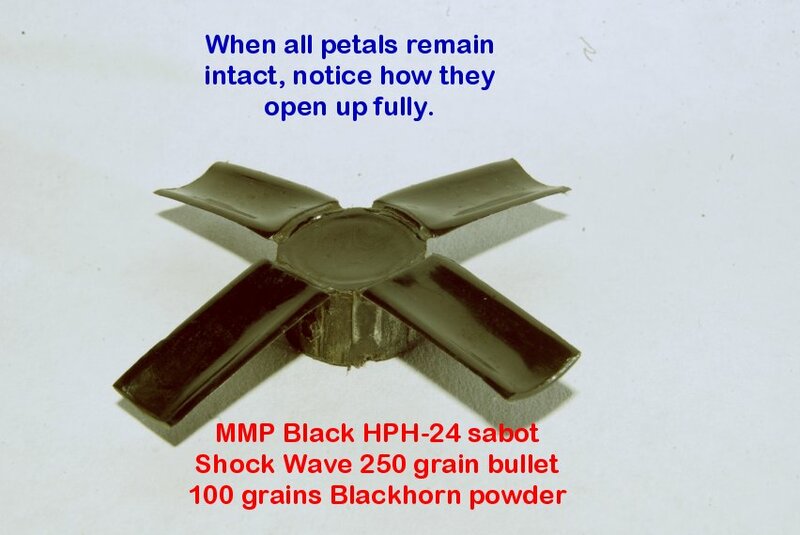 So after polishing my barrel, I am now able to shoot either sabot without cleaning using Blackhorn powder. The longer 290 grain bullet seems to fly slightly better in my barrel... 28 inch barrel and one in 28 twist. 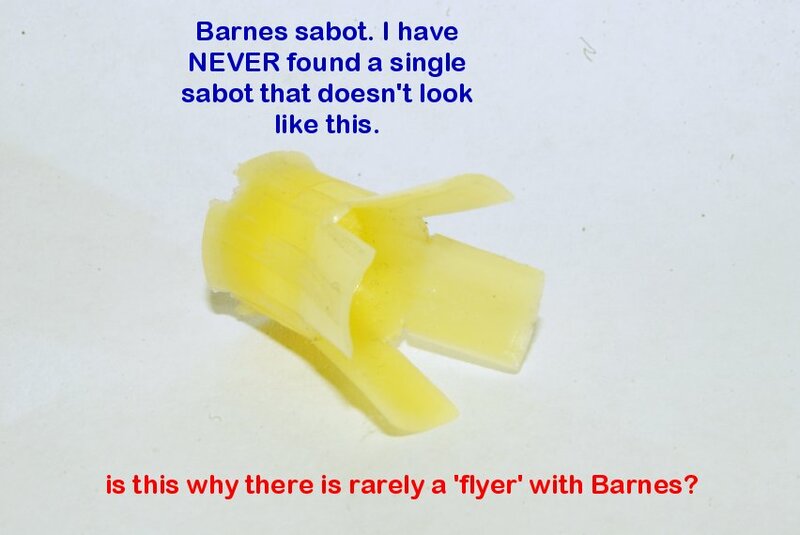 Is it the sabot? I'm no expert, but unless I really pull the trigger it's going to be in that 2 inch circle at 100 yards. I can't find every sabot as the snow is very deep. But I usually find one of these after I have a shot that strays. This is how they all 'should' look. 'stock' Barnes sabot with 290 grain TMZ all copper bullet.